An original role-playing game, in which you traverse a grim, sunless world, where the only source of light are the erupting volcanoes, spitting out ash. The production features a nonlinear plot and an open world, both of which can be shaped freely by your actions. Ashen is an open-world nonlinear action role-playing game. It was developed by an indie Aurora44 studio from New Zealand founded by experienced members of film-making teams. The founders met while working on such movies as The Hobbit, The Avengers, Iron Man 2, Prometheus and The Planet of the Apes. The game is set in a grim, sunless world, where the only source of light are the erupting volcanoes, incessantly spitting out ash. 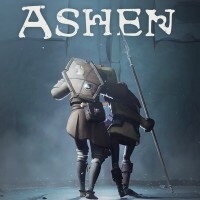 Ashen tells the story of a young wanderer, who traverses this gray world to find a place they could call home. Since all items are sooner or later destroyed by volcanic eruptions, the game focuses on interpersonal relationships with other survivors, represented by other players. In the game, you often have to decide whom to trust and whom to avoid. Those decisions greatly affect the gameplay, as the characters have their own unique abilities, the use of which may turn out to be really helpful later on. As the game progresses, your camp, tiny at the start, turns into a small village inhabited by various other survivors, relying on each other's abilities to survive. While Ashen is an action role-playing game and the in-game world is also full of various monsters, combat is the last resort, as each fight, even with a seemingly weak opponent, may be deadly. Before each battle, you have to prepare accordingly, and during the fight, you have to use elements of the environment. What makes Ashen distinct among similar productions is the unusual passive multiplayer mode. During your journey, you encounter various characters, which may be either other players or AI-controlled NPCs, based on the characters created by others. Thanks to this, every character has a personality, goals, and aspirations.